I have been a mom four times over now and the most difficult time in my children's life is when they are teething. It has been said that if adults had to teethe like babies, we would go out of our minds. Babies nerves aren't totally developed so they have an easier time teething than we would but that doesn't mean it is fun for them. I have spent many nights rocking a teething baby to sleep, or comforting and administering teething medicine. I tell everyone that the teething stage is the toughest for me as a mom and having the proper tools to assist me through this time is imperative. Today, I am going to tell you a little bit about a product that I have used in the past and have recommended to fellow moms. 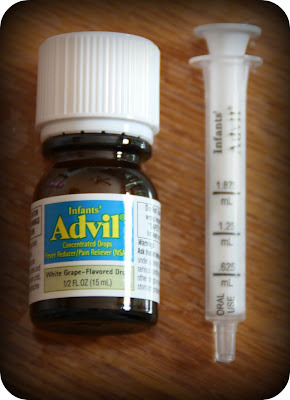 Infant's Advil is a reputable fever medication that is specifically formulated for the youngest members of your family. 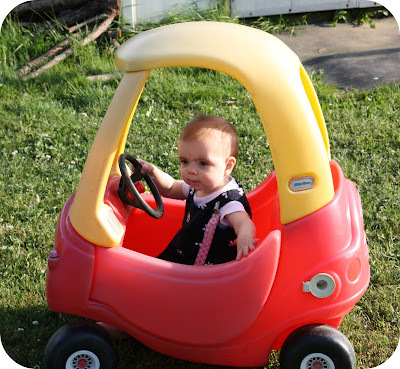 This particular medication can be used in infants from ages 6 months up to 23 months. This is my youngest baby, Rebekah and she will be one in a few weeks. (Remember when she was born?!??! Seems like just yesterday... *sniff*) In the last two months, she has popped out her first two teeth and it seemed like she was teething for months before those teeth came through. My children have all been late teethers. I don't think any of them cut teeth before 6 months and remember one of my sons had four teeth pop through in one week! Oh man, that was a rough week. I used my teething medicine quite frequently then. For this review, I was sent some Infant's Advil to try out and I wanted to share my thoughts with you. This infant's fever reducer is effective not only for fevers, but also for pain and discomfort brought on by teething and other symptoms associated with fevers. Included in the box is a 1/2 ounce bottle of liquid concentration drops and also, a dropper for easy dispensing. 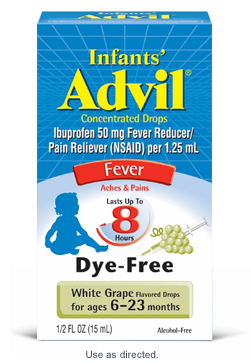 This particular medication comes in a white grape flavor, making it tasty and yummy for little ones. Rebekah is my very first child who hates taking any type of liquid medication. This was no exception. She screams the entire time and I have to fight her to get her to keep the medicine in her mouth. It's so sad. Thankfully though, I can get her to take it and I am pleased to say that she experiences relief withing about 1/2 hour of taking it. The other thing I love about this Infant's Advil is that it lasts up to 8 hours so I can give it to her at bedtime and it can get her just about through the night. No one likes getting up multiple times a night and this has given us some good nights of sleep, for which I am SO grateful. 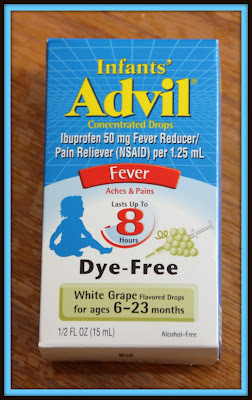 Infant's Advil can be found at mass drug and retail stores across the country and typically, it retails for about $7 - $8 for a 1 ounce bottle, which is a bit bigger than what I received. 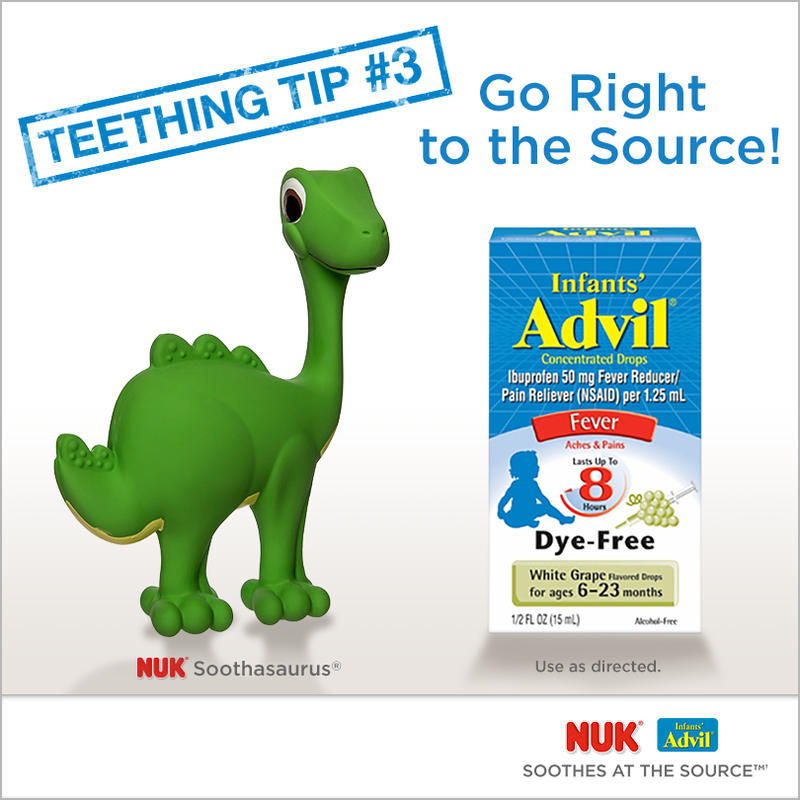 You can also get an Infant's Advil coupon by clicking here. Be sure to ‘Like’ Children’s Advil on Facebook to check out teething advice and join in on the fun teething promotions for a chance to win great prizes! Disclaimer: I received no monetary compensation for this post. As a member of Smiley360, I received free Infant's Advil and product coupons for review purposes. All quotes and stock photos are from the Infant's Advil website, Smiley360 website and email. All thoughts and opinions are 100% mine.